Another glowing review affirming the literary merits of Hug Everyone You Know (whew!). Thank you Kathleen Pooler for your time and care in reading,reviewing, and posting on Goodreads. 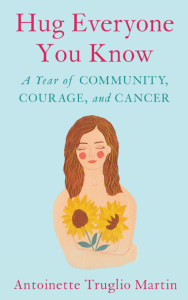 “As a cancer survivor, I found Antoinette Truglio Martin’s memoir, Hug Everyone You Know, to be a heartfelt, honest account of the importance of a community of family and friends in facing a cancer diagnosis. With a voice filled with honesty and humor she portrayed a resilient, feisty woman who met her challenges head-on and sought the support of her community. As a nurse practitioner, it reinforced both how each individual responds to the cancer journey in their own unique manner and the value of respecting these individual differences in supporting the patient as a caregiver. The topic of breast cancer is certainly a relevant one and in sharing her story in such a vivid and passionate way, Martin has delivered a valuable resource for both cancer patients and caregivers. While the topic was compelling, it was her voice—refreshing and real– that kept me turning the pages. As a reader, she pulled me into her inner circle and kept me there until the end. Check out Kathleen’s webpage and blog, Memoir Writer’s Journey. It is chuck full of interesting and inspiring essays. Antoinette Truglio Martin is the author of Hug Everyone You Know: A Year of Community, Courage, and Cancer. The book is published by She Writes Press and will be available everywhere books are sold on October 3, 2017. Congratulations. May you have many more.